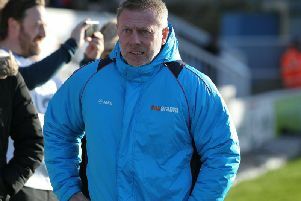 Ronnie Moore had no qualms about putting Lewis Hawkins into the Hartlepool United team for the big FA Cup third round tie against Derby County. And the Pools boss will have no hesitation about using him in the same role against Wycombe Wanderers at Victoria Park this Saturday. Hawks has gone away and done really well with Spennymoor. Moore had used Kal Naismith in that position in League Two but the on-loan Portsmouth winger returned to Fratton Park, leaving a void in the Pools manager’s side and plans. Moore not only recalled Hawkins from his loan stint at Spennymoor, but decided he would play as part of a front three with Scott Fenwick. Despite being sent off for violent conduct for the Moors, the 22-year-old’s form in the Evo Stik Northern First Division were rewarded by his Pools gaffer. Hawkins came in for only his second start of the season in a blue strip – his only previous appeaarance had been against Sheffield United in the Johnstone’s Paints Trophy. “He couldn’t get in the side and that’s why we sent him out on loan and said to him ‘You need to be playing’,” explained Moore. “Hawks has gone away and done really well with Spennymoor. All the reports we’ve had, all the DVDs, all we’ve seen of him in training, he’s looked strong. “I said to Sam [Collins] that I thought it was time we had a different wide right guy – a more disciplined one. “We could have put Kudus [Oyenuga] or Rakish [Bingham] out there but would they be as disciplined in their approach against a side that drop their wingers in and bomb the full-backs on? “The answer to that would have been no. The midfielder was man of the match against the high-flying Rams. And he looks set to play again on Saturday against a Wycombe side sixth in League Two and with their sights set on League One. Hawkins, a player who has come through the ranks at Pools linked up superbly with another, Jordan Richards. The right-back made a brilliant first start of the season and both gave Pools great attacking threat.